(Newser) – You want big picture? 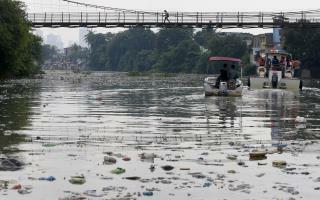 National Geographic provides it on the issue of plastic choking the world's waterways. Invented in the late 19th century, plastic didn't truly take off in terms of production until around 1950, when scientists began making it out of petroleum in earnest. Now, we have 9.2 billion tons of it on the planet, of which 6.9 billion tons are waste. The real problem? The vast majority of that waste—6.3 billion tons—has not made it into recycling bins. Instead, much of it is in our oceans and waterways, often broken down in hard-to-see smaller particles. One alarming stat in the story is that on some beaches in Hawaii, about 15% of what appears to be sand is actually tiny grains of microplastic. You want small picture? The story includes an incredible photo of a seahorse clinging to a plastic cotton swab as it rides the current off Indonesia. I can't find a store that bags using paper bags. I think Albertson's has them on occasion, but hard to find. I use them to place my recyclables in, in the house, then it all goes in my city provided recycling bin. "He floats the idea of a tax of one penny for every pound of plastic resin made, with proceeds used to improve garbage collection in developing nations" Since when has the reason for a new tax gone to that cause? Politicians love to enact a new tax for some "wonderful cause" (save the unwed pregnant baby unicorns), just to reroute that revenue to their personal (unrelated) agenda. We're taxed when we earn money. We're taxed when we spend money. Isn't that enough? Use some of that misguided tax revenue to improve garbage collection in developing nations.